I have more than just fruit conserve recipes, check out more recipes at the bottom of the page. Conserve is easy to make and you will love the bursting fruit flavor on toast, English muffins and desserts. What's the difference between conserve and preserves? 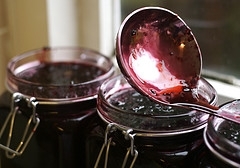 Preserves are spreads that have chunks of fruit surrounded by jelly. Conserves are made with fruits and nuts (on occasion) and are cooked. They have a very thick and chunky texture. Conserves work very well as a spread and as a condiment for meats and cheeses. Conserve are like preserves - fruit preserved by cooking with sugar. My homemade conserve recipes are such a treat in the winter. Serve this over toast, English muffins and even use in desserts. Wash grapes and remove stems. Put in preserving kettle, add only a little water and simmer until the seeds are free. Press pulp through sieve and discard skins and seeds. Add oranges and lemons, and then the raisins or thinly sliced figs. For every pound of fruit add 1 pound of sugar. Boil until thick and put in sterilized jelly glasses and seal. Wash, stem and pit the cherries. Wash raisins. Mix all of the ingredients overnight. Then boil slowly and steadily for several hours, or until thick and clear. Pour into hot, sterilized jars and seal. Mix all ingredients and cook slowly until mixture is thick and clear. Pour into hot, sterilized jars and seal. Peel peaches and remove the stones. Add 2 cups of water and cook until soft. If fresh pineapple is used, cook with the peaches. Mash or rub through coarse colander. If you are using canned pineapple, mix this with the finely cut orange and cook until slightly thickened. Add three-quarters as much sugar as fruit mixture; cooking until thick. Stir to prevent burning and pour into sterilized jars and seal. Pare, core and slice the pears in large pieces (cross-wise). Add sugar and let stand overnight. Drain the liquid into the kettle and boil to a syrup; approximately 12 minutes. Add the pears and the rest of the ingredients. Cook slowly 1 hour until thick and clear. Pour into hot, sterilized jars and seal. Wash the plums, remove the stones and cut into small pieces. Mix with the remaining ingredients and cook until thick and clear. Pack into hot, sterilized glasses and seal. Boil cranberries with half of the water until they burst. Add remaining ingredients and boil for 25 minutes. Pour into mold or glasses. Great for Thanksgiving. Or, just combine all of the ingredients and boil until thick, adding nuts when nearly done. One more of my conserve recipes below. Pare, quarter and core the pears. Pare apples, core and cut crosswise in 1/2 inch pieces. Add the lemon juice to the water. Cut ginger into small pieces. For every pound of fruit, use 1 pound of sugar. Boil sugar and water to a syrup, add the rest of the ingredients and boil 45 minutes or until thick and clear. Pack in hot, sterilized glasses and seal. Let the mixture stand overnight. In the morning, add 2 cups of water and cook slowly over slow fire for 3 to 4 hours. When medium-thick, remove from stove and seal.